Postcard collectors on the Isle of Wight will be familiar with the names of several photographers and producers of postcards; the names Beken, Debenham and Broderick come to mind for example, but a name always near the top of the list will be that of William R. Hogg. This book celebrates Hogg’s work by reproducing over 100 of his photographs in large format and in the highest possible detail to a degree unavailable until now. Without exception they have all been reproduced from Hogg’s original glass negatives – there are no photographs of photographs and no copies of postcards. Thanks to Mr Hogg, today we can enjoy what must have been a comparative rarity, an almost complete photographic record of a Victorian town, frozen forever in a collection of hundreds of glass negatives of the highest quality. Virtually the whole town has been preserved. 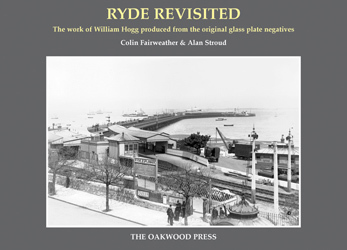 Hogg has photographed scenes of every description, covering nearly the whole of central Ryde including roads, buildings, lanes and in particular, back streets, which were largely ignored by other photographers. He did all this superbly and the photographs are all of the highest technical quality and almost without exception they are perfectly composed. Apart from a small handful, the photographs in this book are exactly as Mr Hogg composed them in his viewfinder. Authors Colin Fairweather and Alan Stroud feel privileged to have been able to breathe a new life into Mr Hogg’s photographs and to present them to a new audience. Large landscape format (210mm x 290mm), 99 full-page plates, 128 pages.